2015 had no shortage of stories on the political edge of sports, but it was the play of female athletes that will mark the past year in history. This past year saw no shortage of people who tried to leverage the sports world to boldly speak out on issues beyond the field of play. The football players at Missouri going on strike against racism; the remarkable activists in Boston—led in many neighborhoods by people of color and women—who kept out the rapacious Olympics; the continuing fight in advance of the 2016 Rio Olympics that’s taking on both the International Olympic Committee and the Brazilian government; South Carolina football coach Steve Spurrier speaking out against the Confederate flag before and after the Dylann Roof murders at Mother Emanuel Church; the courageous statements—amid an ugly atmosphere—of Baltimore Oriole Adam Jones, manager Buck Showalter, and front-office chief John Angelos after the police killing of Freddie Gray and the property destruction outside of Camden Yards; tennis living legend Serena Williams returning to Indian Wells 14 years after being showered with racist invective by “fans”—a return she combined with raising funds for the Equal Justice Initiative; NBA Ref Bill Kennedy coming out of the closet as a response to Rajon Rondo’s homophobia; Atlanta Hawk Thabo Sefolosha’s pursuit of justice after getting his leg broken by the NYPD; the odyssey of Olympic gold medalist Caitlyn Jenner; or even Steph Curry putting the name of slain Muslim student Deah Barakat on his shoes before the All-Star Game. I could name even more. We are clearly in a sports moment when social crisis and inflamed bigotry, conjoined with social media, has created a space for athletes to take their beliefs straight to the public. It’s courageous, and it matters, puncturing the privilege that surrounds the lives of so many fans, like LeBron catching a Bay Area aristocrat in mid-heckle. In June, this moment crystallized for me when my 7-year-old, sports-obsessed son asked me to name my top five must-see athletes. The five mentioned off the top of my head were Serena Williams, soccer star Lionel Messi, Steph Curry, mixed-martial artist Ronda Rousey, and pro wrestler Sasha Banks. It was only after speaking that I did the double take at the ratio. The following month, my entire family was in front of the television cheering on the US women’s World Cup team (except for my daughter, who was pushing for Japan because… she is really into Japan.) Of course, we were not alone. The World Cup finals had ratings that would have made any men’s league—save the NFL—cry with envy, as well as a goal from Carli Lloyd that will be replayed forever. We also had WNBA player Maya Moore continuing to go for GOAT status, and Elena Delle Donne showing that she may not be too far behind. We saw Sasha Banks and Bayley giving us the wrestling match of the year… twice, and we continued to witness Breanna Stewart’s UConn Huskies reign with unchallenged dominance. Women’s sports also gave us the year’s two most stunning and compelling upsets: Serena’s gut-punch US Open semifinal loss to the unheralded Roberta Vinci, and Rousey going down after a kick in the head from Holly Holm. If you weren’t talking about these contests, then you were not engaged with the sports world of 2015. In many ways 2015 could not have ended with a moment that was more on the nose. Serena Williams was named Sports Illustrated Sports Person of the Year: a glaringly obvious choice after three grand slams at the age of 34. Yet a small sector of social media erupted with anger that the award—for Sports Person of the Year, remember—did not go to a horse, triple-crown winner American Pharaoh. 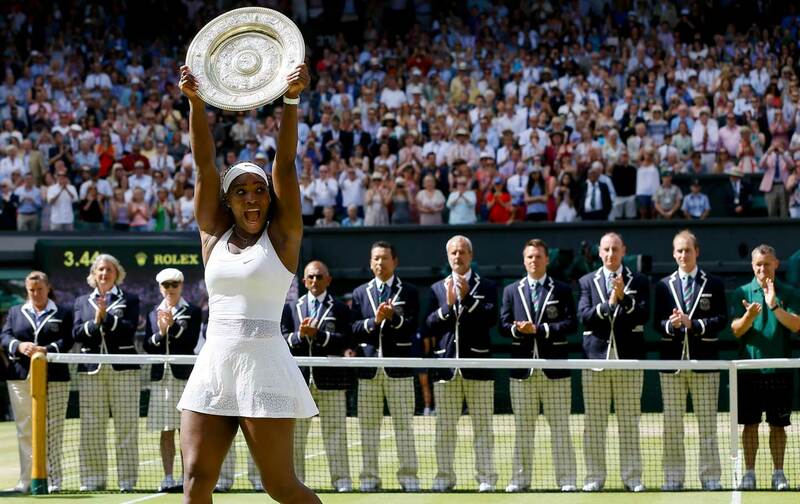 It was dead-enders showing their own irrelevance, while Serena literally took the throne. Time will tell, but I believe that we will remember 2015 as a pivot point when women in sports took it to that next level and through their play offered the sharpest possible rebuke to what has at times seemed over the years like an anchored, immobile state of second-class citizenship. Let’s see what 2016 and beyond will bring, but for the father of a daughter who often thinks sports is not for her and a son we’re trying to raise in the 21st century, 2015 was a game changer. This was the Year of Women in sports, and over the next years I think we will see the reverberations of last 12 months well beyond the playing field.